Bruk din sosiale profil for å logge inn raskere. 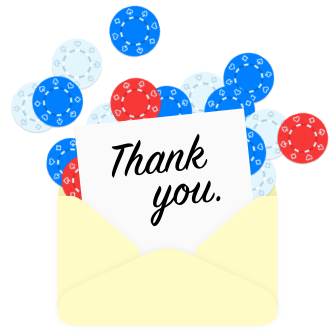 Thanks for signing up to get the PokerNews newsletter. We won't bombard you with emails but will get you the best and latest in poker news, poker strategy, and special promotions. You can always adjust your email preferences by going to your Profile Settings. Get started exploring PokerNews as we have over 15 years of content ready for you. Poker news is our bread and butter; we bring you daily news from the world of poker. We cover every big tournament, interview the biggest names in poker, and publish updates from the world of online poker on a daily basis. All readily available in the NEWS section. If you're looking for a (new) place to test your skills online, PokerNews has exclusive deals with all the online poker rooms in the world. We have extensive reviews and bonuses for all of them. Check out our Online Poker section and sign up with one of our great partners to get started. We have an extensive list of poker strategy articles, written by some of the best poker players and experts of the game. Check out the strategy section if you're looking to get the latest tips and tricks - we have a dedicated section for players who are new to the game, seasoned players, and full-time poker professionals who want to stay up to date on the latest developments of this ever-changing game. We're known for our Live Reporting as well, bringing you live updates from poker tournaments all over the world. If you're wondering how your buddy is doing in that EPT event in Barcelona or how big a stack Daniel Negreanu has at the World Series of Poker, PokerNews is the exclusive place to find written updates. We have seasoned reporters, photographers, and video teams all over the world to keep you up-to-date. 3D for movies is so insanely overrated. Pokernews.com er verdens ledende poker nettsted. Besøkende vil finne en daglig dose av online poker og vanlige poker artikler med siste nytt, live rapport, eksklusive videoer og en omfattende online poker rom med detaljerte poker vurderinger.